The complicated movement, with the dial inscribed “Schmit a Paris”, tells seconds, hours, the days of the week and the date. The dial is also inscribed: “MANUFRE. DE MGR. LE DUC D’ANGOULÊME”. The dial is signed by Coteau. 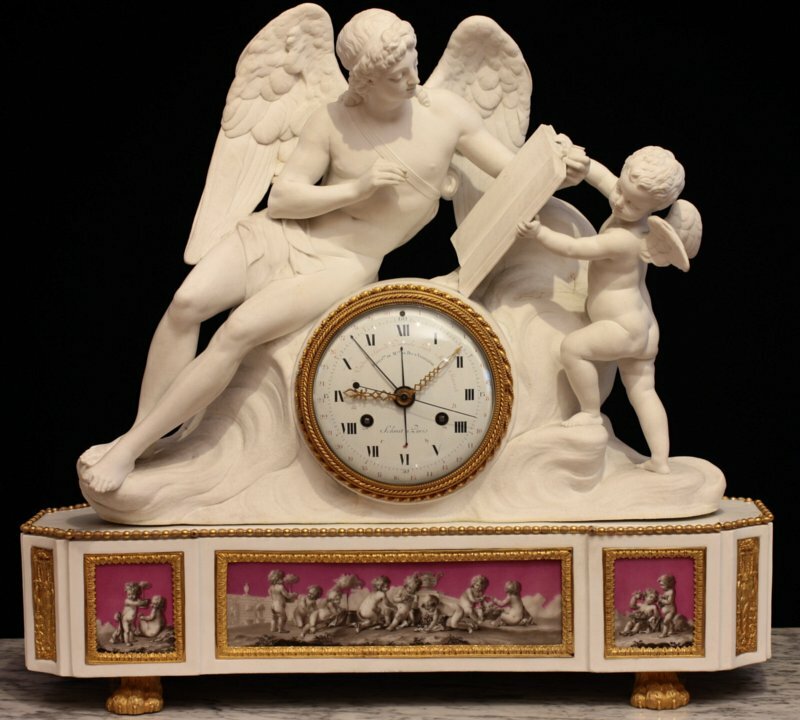 There is a nearly identical version of this clock at Waddesdon Manor. Another clock of this model was lot 103 in the Luttrellstown Castle sale held by Christie’s in Ireland on September 26-28, 1983. A slightly later Dihl et Guérhard (the successor company of the Angoulême manufactory after the Revolution) biscuit group in the collection of H.M. the Queen portrays the same adult figure, but without wings, transformed into Apollo Instructing the Shepherds. (See: Régine de Plinval de Guillebon: Les Biscuits de porcelaine de Paris; Faton, 2012. Page 214.) George Washington may have owned a version of the Apollo group.